Sam Maples is a seasoned trial attorney in many areas of civil litigation. 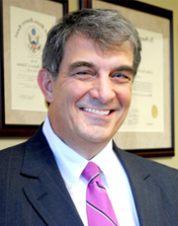 He practices primarily personal injury law, workers' compensation, and general civil litigation. Sam has tried over 100 jury trials and over 200 bench across several Alabama counties. Sam has also successfully litigated cases in Mississippi, Tennessee, and Texas. In the past, Sam has served as a municipal attorney and a Contracts professor at the Birmingham School of Law. He is a member of the Alabama Association for Justice. Sam is also active in both the Bessemer and Birmingham Bar Associations. Sam grew up in Bessemer, Alabama where both sets of his grandparents settled, after emigrating from Sicily in the early 1900s. His grandparents became an established Bessemer family known for hard work, business entrepreneurship, and community leadership. Sam is married to Rita Strauss Maples, and has one daughter, Margo. Sam is a long-time member of Our Lady of Sorrows Catholic Church. He is also a member of the Italian American Heritage Society. Sam is an avid golfer, an Alabama football fan, and enjoys spending as much time as possible with family and friends when he is not engaged in his law practice. No representation is made that the quality of legal services is greater than the quality of legal services from other law firms. © 2019 Maples, Tucker & Jacobs LLC.. All Rights Reserved. Site designed by Zeekee.